Bold and original, the Scots Pine will keep you festive this holiday season. Both of us grew up celebrating Christmas. We still do. One year we visit one family in Connecticut, with hopes of freshly fallen snow blanketing the New England landscape; the next year, we escape the cold Brooklyn for the dry, saguaro-spiked desert called Arizona. Truth be told, we’ve never spent Yuletide in NYC, but we vow to spend Christmas in New York in the near future. That would make our job of making creative Holiday-themed cocktails a little easier, since we have over 150 bottles of booze on the shelves, and in the fridges (one regular-sized and two mini), with spillover in the sideboard. With all those bottles, experimenting becomes a chore insofar as we have to decide among six ryes, eight gins, seven bourbons, four orange liqueurs—you get the idea. It’s a chore of which we never grow weary. What we imagine being a full-time taster for Häagen-Dazs or Ben & Jerry’s might be like. But being part-time cocktail tasters is just as fun. Indulgence has its limits (same as with ice cream), so you kind of have to know ahead of time what you want your cocktails to taste like; thus, what spirits, juices, and other ingredients you’re going to be working with. So, when your booze arsenal is vast and varied, you tend to use items you normally would keep hidden at the back of the shelf. It’s good to bring these spirits to the fore to challenge your creativity. Over the years, we’ve been playing with the flavor of pine. Yes, pine, as in fir tree. The conifer you bring indoors and decorate year after year, just so you can get high on the piny smell of Christmastime. So we offer you two drinks that find their roots in pine and we bestow them names that befit their essence, O Tannenbaum and Scots Pine. Paul came up with the Scots Pine a few years back, unbeknownst to Steve, who was away visiting family. Scotch whisky was primed to the be the main ingredient since Steve isn’t the biggest fan of the spirit. 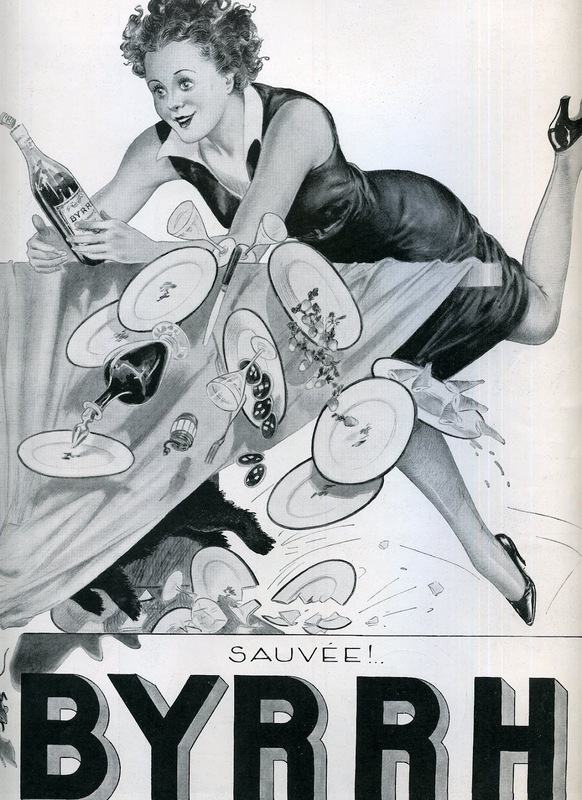 And Paul was itching to mix with a recently acquired bottle of Zirbenz stone pine liqueur. This liqueur smells like someone baking blondies in the middle of a coniferous forest. The taste is mildly sweet and resinous. It is definitely one of those things that make you go hmm, then mmm. Paul felt he was onto something when he mixed it with a blended scotch, but when he added some sweet vermouth (particularly Carpano Antica), he knew he was onto something. Here was a scotch cocktail that got some zing from the Zirbenz, but then a little taming and smoothing over the rough edges from the vermouth. Alas, a scotch cocktail that Steve would like. An orange peel expressed over and dropped into the glass was the one last touch needed to elevate this lovely drink to even lovelier. The Scots Pine is the perfect cocktail to share with friends over an intimate Holiday gathering. A few sips will open the palate and pair nicely with an array of cheeses and little nibbles, like spiced nuts, preparing the way for dinner. Stir in ice for 30 seconds. Strain into chilled cocktail glass or coupe. 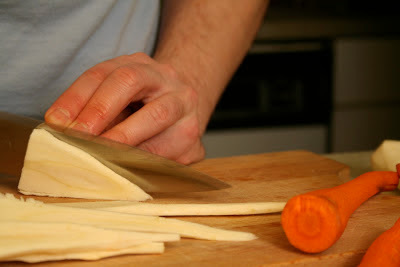 With a vegetable peeler, peel a 3/4 × 2-inch swatch of orange, but careful not to get any pith. Express peel over drink and toss in. After dinner, you might want to gather round the dessert buffet with a simple drink we call O Tannenbaum. We came up with it one night when trying to come up with a cocktail for a NYC theatre company’s holiday party. It’s an odd bird really, using an old timey liqueur called crème de noyaux (pronounced nwah-YO), a primary ingredient in a pink squirrel (a great name that makes sense since crème de noyaux is almond-flavored and, in most instances, bright red). Mixing almond flavors with the juniper flavors in a London dry gin creates a piny explosion. 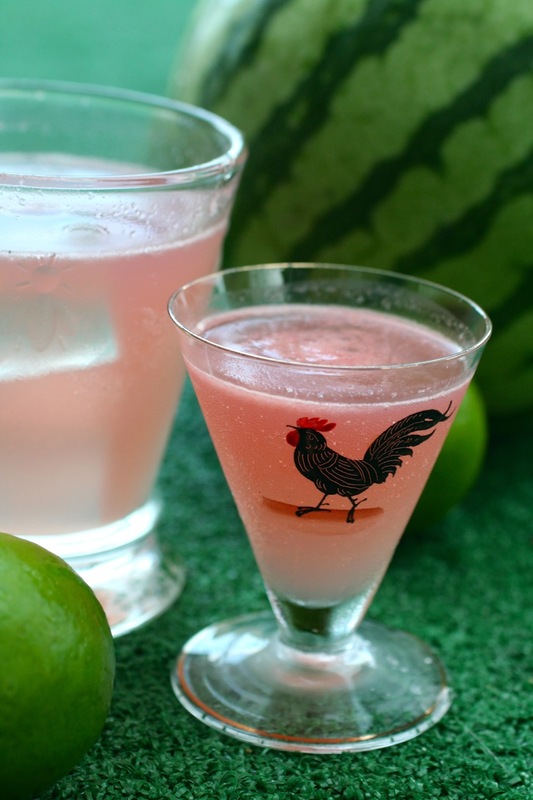 The half and half unites these flavors with its mellowing caress of dairy, giving the drink a bright deep pink hue. Perfect for nibbling cookies by the fire while lovingly gazing at the tree. Shake in ice for 15 seconds. Strain into chilled punch or small cocktail glasses. Garnish with nutmeg, if so desired, for an extra spicy kick. Serves 2 (or 1, if you’re terribly thirsty). If you love the taste of pine, you must try Clear Creek Distillery’s Douglas Fir eau de vie. The aroma is slightly redolent of pears, with a hint of pine, but when drunk with a little water to soften its alcohol content (47.73%), the roles reverse. You taste the resinous pine, mellowed by a hint of pear. Exquisite. One thing that is permanent is change. Our tastes change all the time. One day we’re loving the sleek simple lines of a Calvin Klein sheath, the next we’re extolling the rococo color explosion of a Hermès print. This holds true for cocktails. 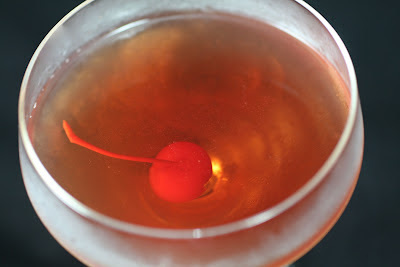 Right now we are really into up drinks, like Manhattans and all their variations. Perhaps it’s the weather—in the colder months, we’d rather not be holding a glass of ice-filled social lubricant that continually negates the alcohol’s warming properties. But, alas, these rocks-free libations can be a little more difficult to pair with food. Especially if the cocktail uses spirits high in proof. 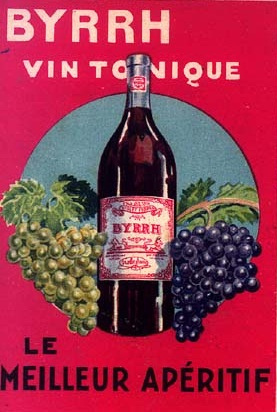 (Ever take a sip of one after eating a bread-heavy canapé? It’s like tasting a communion wafer dipped in cheap wine. Alcohol throat-burn is not something to strive for when creating a harmonious cocktailing experience for your party guests.) “Up” cocktails, though, can and should be good foils for the hors d’oeuvres and party snacks we put into our mouths. That’s why we come up with perfect pairings. But perfect parings are never actually set in stone. Our tastes not only change then, they evolve. 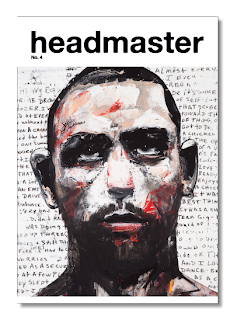 So, it’s important for the development of any chef, artist, writer—any creative person really—to reach into the past and reinvestigate matters that now, in the light of day, have become a bit troublesome. So now we will look back at an old cocktail recipe we honed years ago, one about which we have since changed our opinion. The Jack Rose is that cocktail. The recipe is simple: applejack, lemon juice, and grenadine. Applejack is a Colonial American invention that was first made in an unusual process known as freeze distillation, also known as “jacking.” Apple cider (so important to these early settlers since potable water was hard to come by) is left to freeze during the cold months. 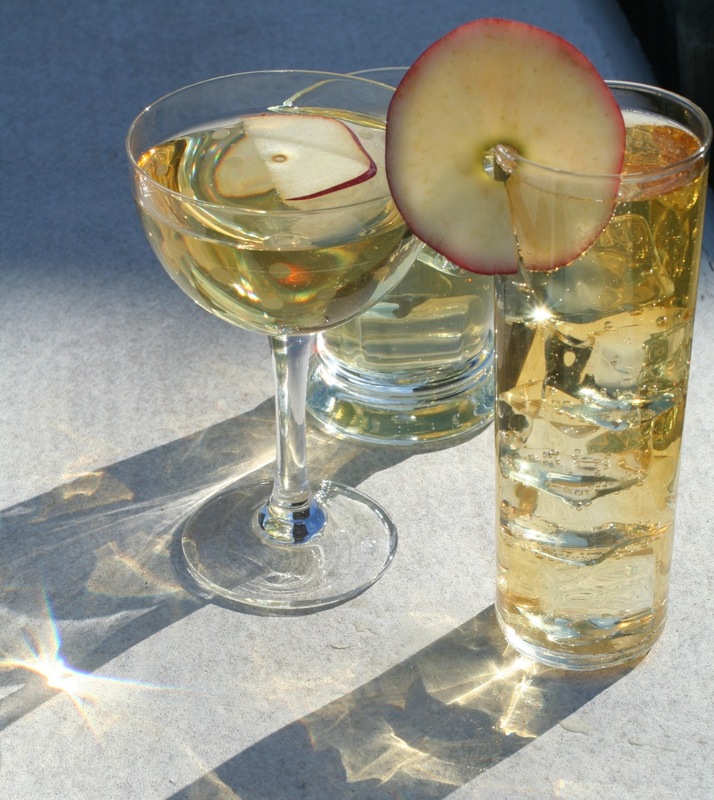 Chunks of ice are removed from the cider when the water separates from the alcohol, making the remaining alcohol much more concentrated. Standard distillation supersedes this quaint process, and the liquor is much cleaner now, allowing for easy mixing with other spirits, juices, and sugars. 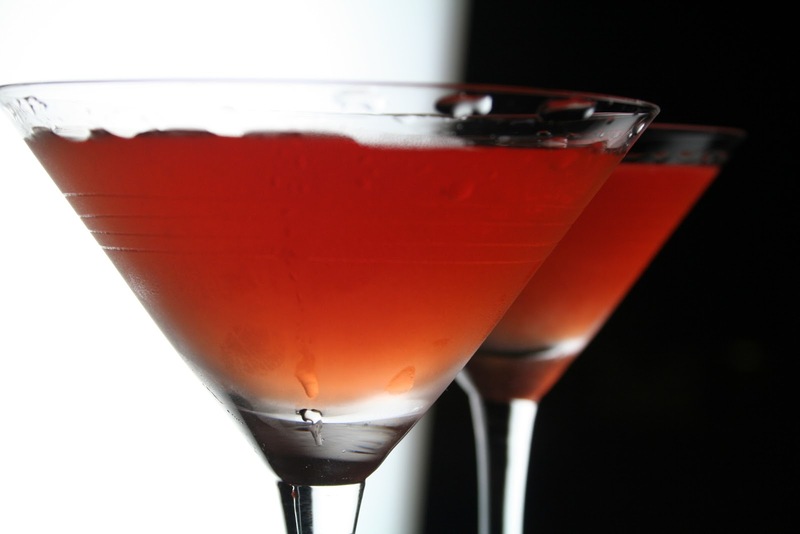 Grenadine is essentially pomegranate and sugar, boiled down to a slightly viscous syrup. 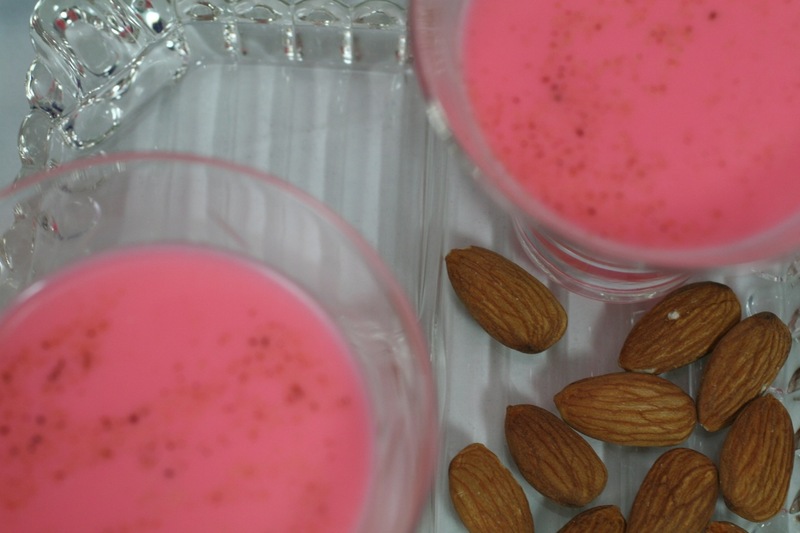 When we first starting shaking these rosy-hued beauties and pairing them with simple fair, such as spiced nuts, we had three goals in mind, so as to avoid the dreaded alcohol burn. Keep the sugar content on the plus side (the sweeter drinks usually pair more easily with the natural sugars in food). Make sure the cocktail has a decent amount of acid (such as juice, dairy, or wine-based spirits), since these acids create new flavors when confronted with foods ’ sugars and starches). In our first iteration of the Jack Rose, we dutifully applied all three of these objectives: Applejack (Laird’s) with an alcohol content of 40% (the lowest level of alcohol a spirit can have to be called a spirit), check; a generous amount of grenadine (real pomegranate grenadine) to bring out the sweetness for easier food-pairing, check; and an amount of lemon juice to balance the alcohol and sugars, check. It’s a little on the sweet side, which may be off-putting to some, but allows for easier food pairings, especially with spiced nuts that in simpler circumstances would go well with an ice-cold beer. But getting back to our main topic. 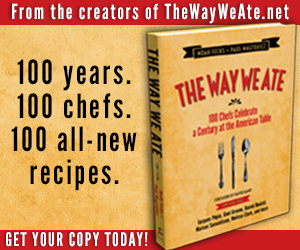 Over the years, we’ve grown a little tired of our recipe. You see, we now prefer a higher-proof applejack that is far superior to our 40% abv applejack. 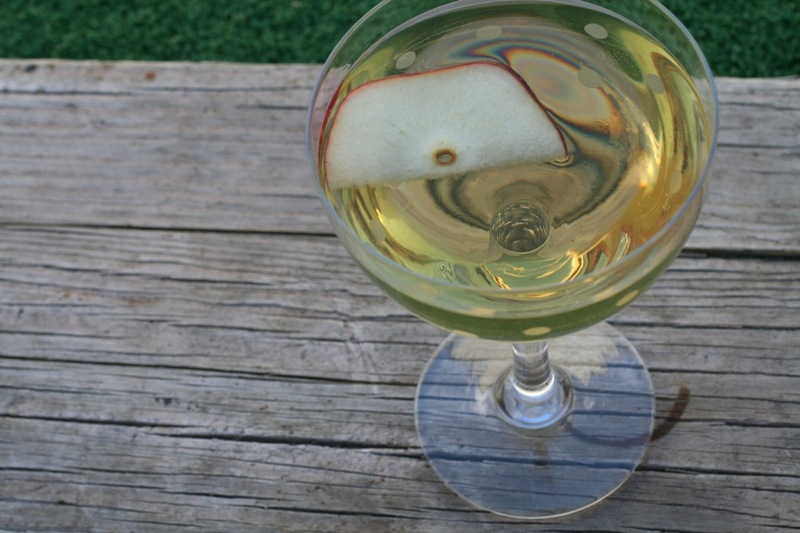 It’s Laird’s bonded (50% abv) apple brandy. Much more complex, a little sweeter, and a little more fruit-forward, this spirit needs less sugar and more acid when mixed as a Jack Rose. Keep in mind, though, that not all grenadines are created equal. Stirring s makes a decent one that is sweet, but not too sweet, such as the one made by Williams Sonoma. Avoid any all–corn syrup grenadines that look like fake blood in a bottle. Better yet, make your own, so that you can control the level of sweetness. Follow the recipes below, and you can whip up a perfect pairing that requires very little measuring, once you’ve got your ingredients all in place. Spiced nuts would be an ideal accompaniment. * Some brands are sweeter than others. Alternatively, you can make your own. See recipe below. Shake in ice for 15 seconds. Strain into chilled cocktail glass or coupe. 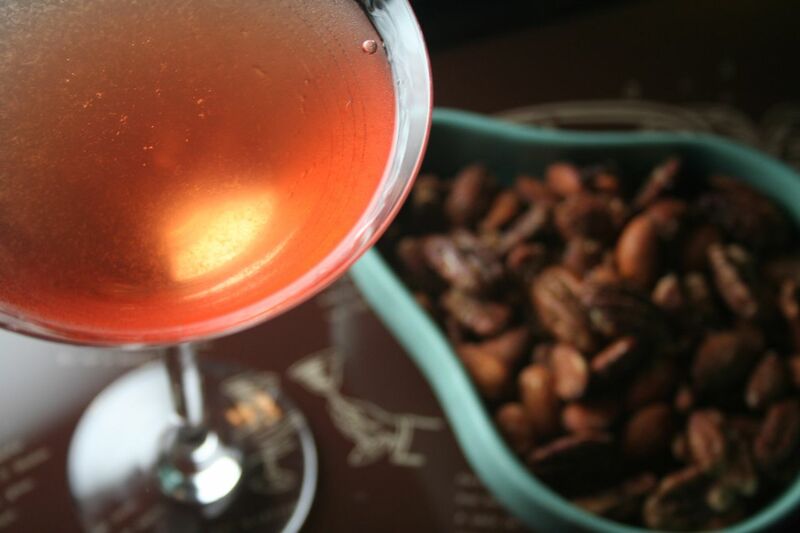 Spiced nuts are the perfect accompaniment to a well-crafted Jack Rose. 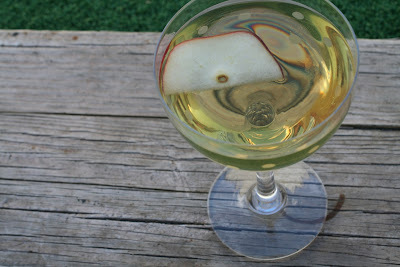 Another great drink to try that uses apple brandy is the Hurricane Sandy. * You can always make this from squeezing pomegranate pips by using a hand citrus squeezer. Two large and heavy pomegranates and a splash of water should do the trick. This is very messy, so wear an apron and squeeze into a deep, wide bowl. Bring pomegranate juice to a boil over medium–high heat. Reduce heat to a simmer and add sugar. Stir gently until sugar is dissolved. Keep heat low and simmer for up to 15 minutes, until mixture is slightly reduced. Allow to cool. Add vodka and stir. May be kept for quite a while in the refrigerator in a clean 750ml bottle (or 325ml bottle for half recipes). 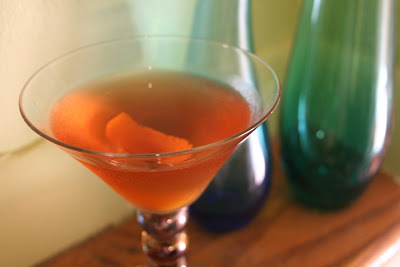 Orange flower water (also known as orange blossom water) adds another layer of flavor to the grenadine. Anywhere from 1–2 teaspoons stirred in once the heat is turned off. Lemon juice may round out the sweet-tartness. A half teaspoon should do the trick. Pomegranate molasses may add that super pomegranate flavor you might be looking for. Add about an ounce at the very end of simmering, stirring to incorporate. 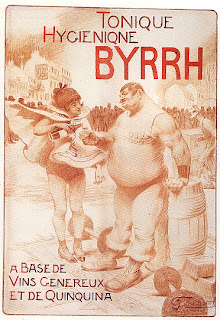 Other libations that use grenadine are the Fjord, Global Punch, the Hurricane, the Monkey Gland, and the Scoff Law. Preheat oven to 400°F. Spread nuts onto a cookie sheet or ceramic baking dish. Put in oven on center rack for about 15–18 minutes. Mix the salt, mace, cumin, sand brown sugar in a small bowl. Set aside. Melt the butter on stovetop. Set aside. Once you smell the nuts, they are most likely done (do not burn). Remove from oven and add to a mixing bowl. Pour melted butter over nuts and mix thoroughly. Add spice mixture and mix thoroughly. Pour nuts into a serving bowl and sprinkle any remaining spice mixture on top. To watch our video pairing the our first iteration of the Jack Rose cocktail with spiced nuts, click here. Sweet Bacon Bites, packing an umami punch, highlight one of our favorite taste combinations: sweet and salty. The ongoing trend of adding bacon to just about everything doesn’t seem to have peaked, but rather continues to pique the imaginations of chefs and home cooks all around the globe. For years, we eschewed bacon with proclamations of “too fatty,” “unhealthy,” and the weakest excuse of all, “What will we do with all the grease?” Well, those days came to an end one day when our defenses weakened as we spotted a greasy spoon while on a road trip to Tennessee to experience Dollywood and Graceland. We plopped ourselves down in the welcoming booth and, during the course of our lunch, proceeded to devour crisp slices of bacon with, what else, eggs over easy with a side of creamy grits. We survived the road trip and the bacon, so we thought that since everyone seems to love bacon again, why not just make something that’s all bacon, with a little sweetness added. A little light brown sugar sprinkled on top creates a crisp, succulent chew with every bite. 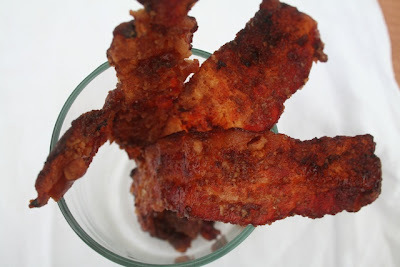 You can sprinkle other pantry items on top of the bacon as well, like crushed pretzels, pecans, you name it. Let your whimsy be your guide. Although, as Sister Maria chirps in The Sound of Music, we do recommend you start at the very beginning and just use light brown sugar. It’s a very good place to start. Preheat oven at 400°F. 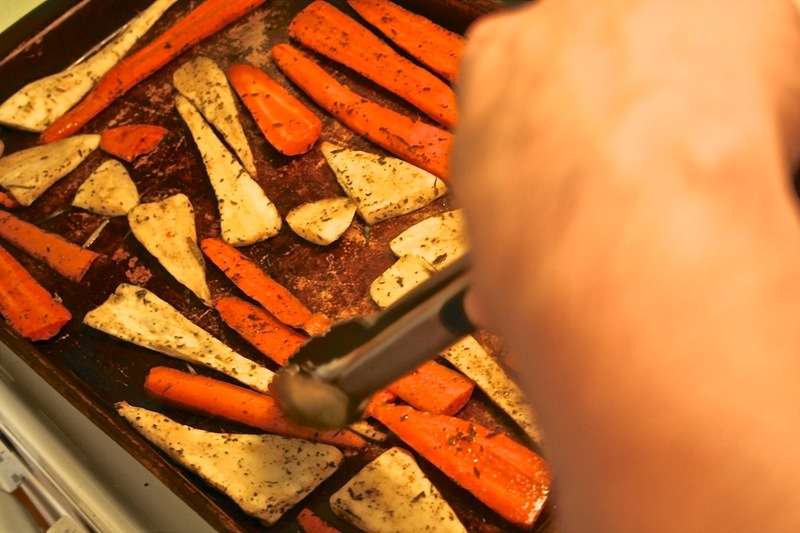 Cover baking sheet with parchment paper. Place bacon slices in a single layer, side by side but not touching, on parchment. You can slice the bacon in half, thirds, or quarters depending on how long you want each piece (shrinkage is minimal). Sprinkle light brown sugar making sure to cover the bacon and not the parchment. Bake for 13 minutes. With tongs, flip bacon slices. Bake for another 5 minutes. Remove from oven and allow to cool before serving. If you leave the bacon slices intact, you can serve them in a wide-mouthed jar or vessel. Save the bacon grease in the fridge for another application. We’d be hard-pressed to find a drink that clashes with Sweet Bacon Bites. It goes with just about anything. We’ve narrowed it down to a few drinks in our arsenal. And these caramelized nuggets of lusciousness are ideal for a brunch gathering or an evening party. Just make sure you have enough. 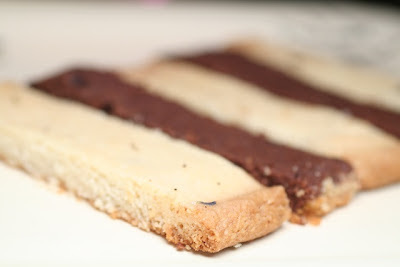 Shortbread Fingers with Lavender and Cocoa Shortbread with Chiles. The buttery crumb can’t be beat. Shortbread with a little nightcap can set the stage for a lovely holiday gathering or the perfect way to end a dinner party. The “short” in shortbread derives from shortening, and anyone familiar with these delicate confections knows that butter plays a prominent role in its flavor and crumb. Culinary scholars like to attribute its 16th-century invention to Mary, Queen of Scots, but many believe the confection is derived from medieval times, when yeasty biscuits were baked twice, hardened into rusks, and sprinkled with sugar and other spices. Today, we eliminate the yeast and only use four basic kitchen staples to create this centuries-old cookie: butter, sugar, salt, and flour. Mix them all up, and form the doughy mass less than a half-inch thick on a baking sheet, and bake. While “plain” shortbread is fine for your party, we like to add a few ingredients to create a more flavorful crumb. 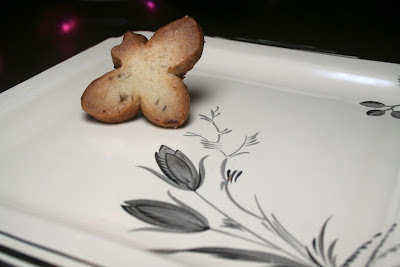 The lavender shortbread is a perfect partner for a Rusty Nail. The floral notes in the buds lend old-world lightness to the sweet and peaty punch in this classic drink. It also pairs exceedingly well with our newest drink, courtesy of Jerry Sheets (Steve’s mom’s husband), called Scotch Aggravation [SEE RECIPE BELOW]. This mix of your favorite blended scotch, with milk and coffee liqueur, will remove any lingering irritations you have carried over into your evening. It tastes a bit like smoked chocolate milk. And if you’re a fan of chiles and chocolate, our Cocoa Shortbread with Chiles will brighten up your taste buds as you sip a creamy, cooling cocktail, such as a Maltese. If the Queen of Scotland had hot peppers and chocolate at her disposal, we’re certain she would have made these her go-to snacks while relaxing at the end of a long workday with a flagon of scotch. Use cookie cutters to create fun shapes with your shortbread dough. You can shape the shortbread dough into a circle and score it so that you will have wedge-shaped cookies. If simple shapes aren’t floating your boat, and you’re making the lavender shortbread, why not use your favorite cookie cutters to create fun shapes. Just shorten baking time by five minutes. If you want your cocoa shortbread spicier, add up to a quarter teaspoon more of the ground chiles or chile powder. 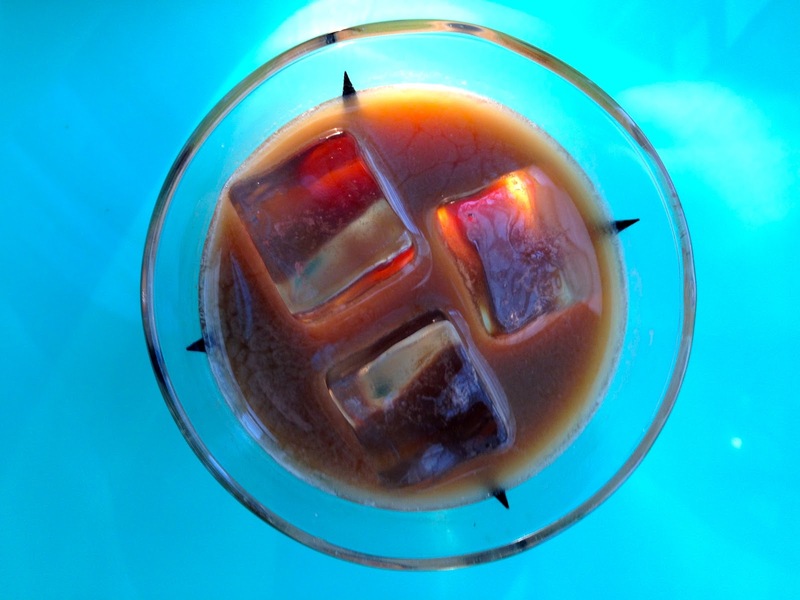 In an ice-filled rocks glass, add the scotch and Kahlúa, then as much or as little milk as you desire. Stir. 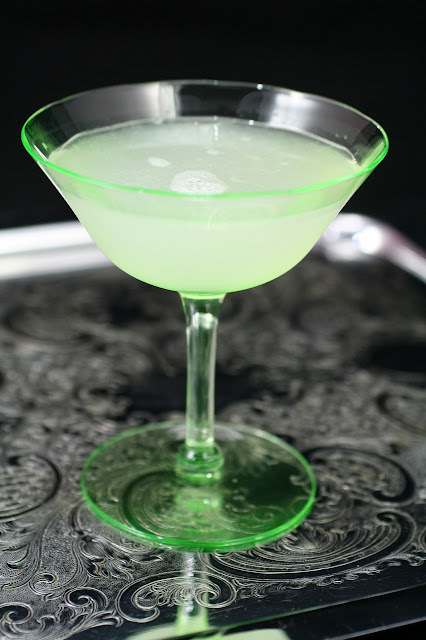 The luminescence of a classic Daiquiri will light up your night. 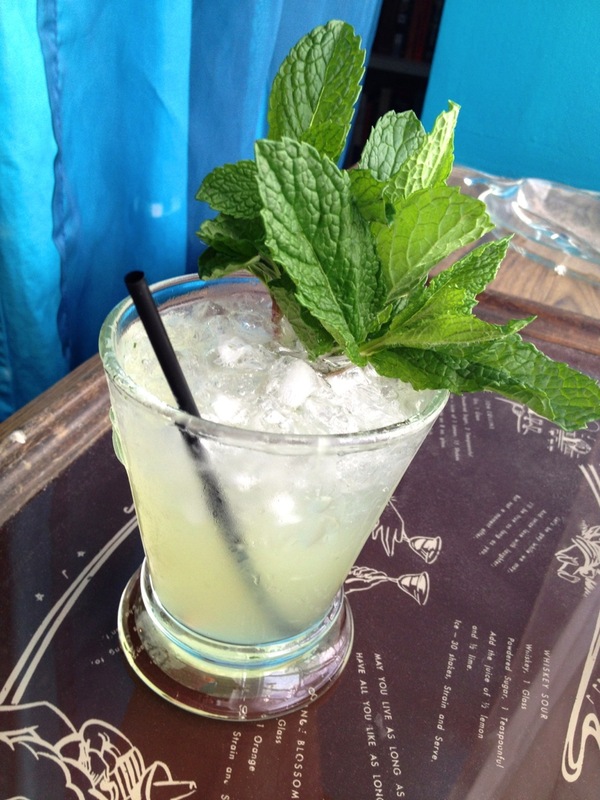 Ask anyone from the North Pole to Tierra del Fuego about the Daiquiri, and she will probably say, “I love Daiquiris. I drink them all the time.” Chances are the version she’s drinking is a frozen Daiquiri, and perhaps one with strawberry, banana, or some fruit other than just lime tossed into the blender. This is fine if you like slushy drinks. (Slushy drinks are enjoying a cocktail renaissance at the moment and, during these dog days of summer, may be just what the doctor ordered!) But we’re here to proffer a less noisy interpretation of the original Daiquiri, one that doesn’t involve worrying about having enough ice in the freezer, or a blender that is sturdy enough to grind it to fine crystals; one that goes back to its roots as one of “six basic cocktails” according to David A. Embury is his seminal mid-20th-century classic The Fine Art of Mixing Drinks. 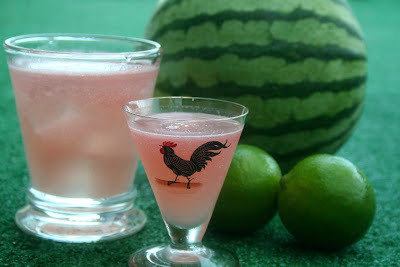 What we discovered when trying to come up with the perfect recipe for the Daiquiri, one that would work with a variety of party food, isn’t really the amount of sugar or light rum in the drink, but the quality of the lime. Pick the freshest one you can find, one so fresh that, when you cut it in half, the oils from the peel mix with the pulpy juice and instantly hit your nose with the smell of its fresh limy essence. After you toss some wedges into a mixing glass along with the white sugar crystals and muddle the heck out of the pair, you will be left with the most delicious juice possible. 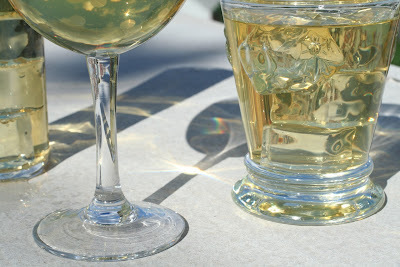 The oils are released from the sugar crystals abrading the lime peel, and they dissolve in the chartreuse-colored juice. But what about the strangely spelled name daiquiri? Where does it come from? A little Web-sleuthing reveals that the name derives from Daiquirí (die-key-REE), a beach and an iron mine in Santiago, Cuba, where it was putatively invented by American mining engineer Jennings Cox, who happened to be in Cuba at the time of the Spanish-American War. 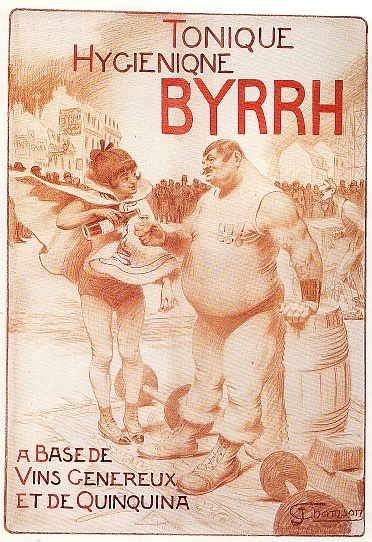 As the twentieth century progressed, and relations with Latin American countries, such as Cuba, prospered, rum consumption grew, and the Daiquiri, as well as all things Latin American, spiked in popularity. Although perfect for any time of year, summer feels rather appropriate for a Daiquiri. The commingling of juice and oil from the limes lends itself to rather remarkable food pairings, especially Guacamole with Chips, and Shrimp Cocktail. ¡Salud! Cut the lime into wedges and add to a shaker. Sprinkle sugar on top. Muddle vigorously, extracting all the juice from the lime, allowing the sugar to dissolve. Add rum and ice. Shake for 15 seconds and strain (or double-strain if you do not want any tiny stray bits of lime pulp – although, if serving with party food, the little lime pulp bits may add flavor nuances) into a chilled cocktail glass or coupe. Warmed olives, seasoned with herbs and spices, pair well with dry gin and vodka cocktails. 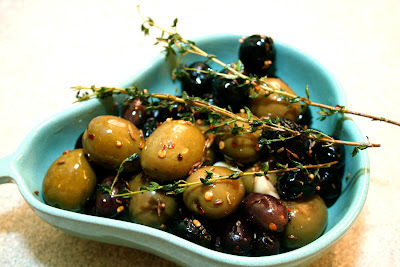 Steve was inspired to reinvestigate Alice Waters’s renowned “warm olives with thyme” recipe in The Art of Simple Food when he sipped his first Vesper cocktail. 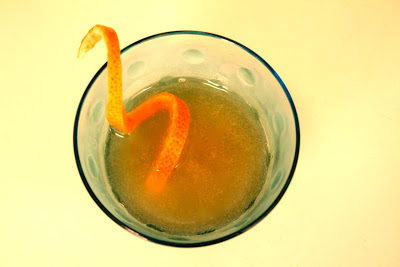 So after taste-testing her recipe side-by-side with this classic drink, he decided to toss in a few more ingredients to her mix, and lower the Vesper’s alcohol content by using less gin. His additions worked magic. Warmed ever so gently in a bath of herbs and spices, these olives deliver a punch of flavor thanks to the interplay of thyme, cumin, and red pepper flakes. They’re addictive on their own. 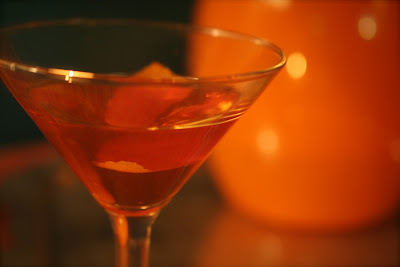 But paired with a cocktail like the Vesper [SEE RECIPE BELOW], or a Martini if you feel so inclined, the hint of citrus infused in the warmed olive oil brings all the flavors together and makes for a piquant pairing with strong drinks. And the most beautiful thing about this recipe is its ease. In the minutes it takes to meld all the flavors, you can stir up some trouble at the bar and mix some ice-cold cocktails. The olives will be ready as your guests raise a toast. Rinse olives thoroughly, drain, and let dry. Meanwhile, heat olive oil in a skillet over medium–low heat. Add all the ingredients and mix until coated with oil. Warm for about 5 minutes, stirring occasionally. Serve warm or at room temperature. Pairing Warmed Olives with cocktails seems easy at the outset, but olives have a way of making sweet cocktails taste, well, not so good. Our advice: Stick with savory cocktails, and those employing gin or vodka as their base. 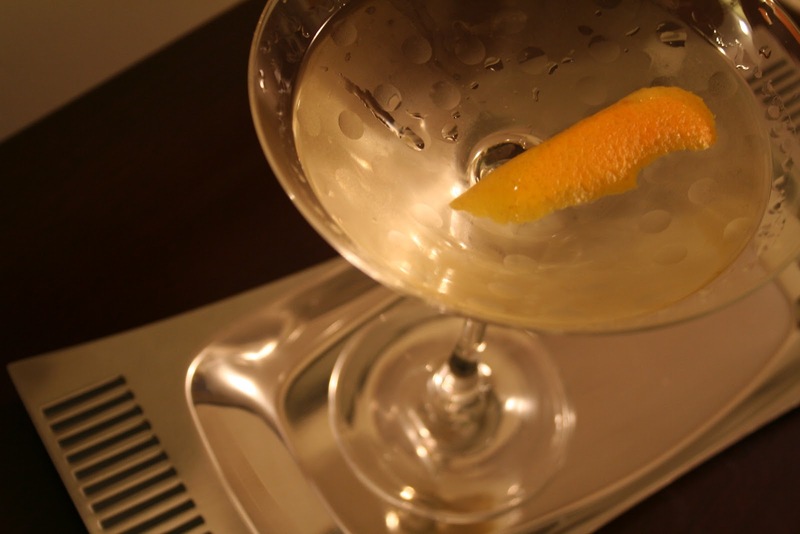 Our favorite is the Vesper, made famous by Ian Fleming in Casino Royale, his first James Bond 007 book. Gin is the main ingredient, followed by vodka, then Lillet blanc, a winy, lightly herbal quinquina (an aperitif that has quinine as an ingredient). If you use a variety of olives, you’ll notice that each one brings out a different flavor note in the cocktail. Your taste buds will thank you. Meet the Vesper, James Bond’s preferred cocktail in Casino Royale. Stir in ice for 30 seconds. Strain into well chilled cocktail glass. Add orange peel. For the Vesper, we like to take a firm orange and use a standard vegetable peeler to get a nice wide garnish for the cocktail. 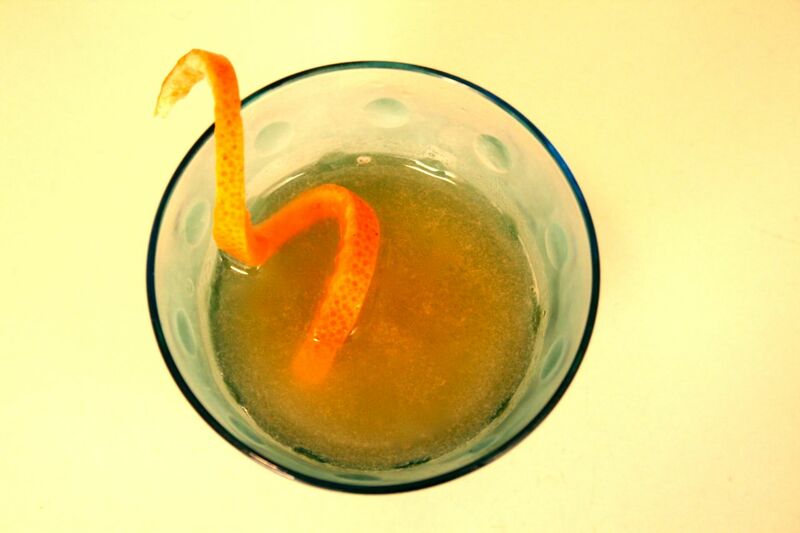 Make sure to peel the orange over the Vesper to impart the oils from its rind. Lemon works just as well if you don’t have any oranges handy. 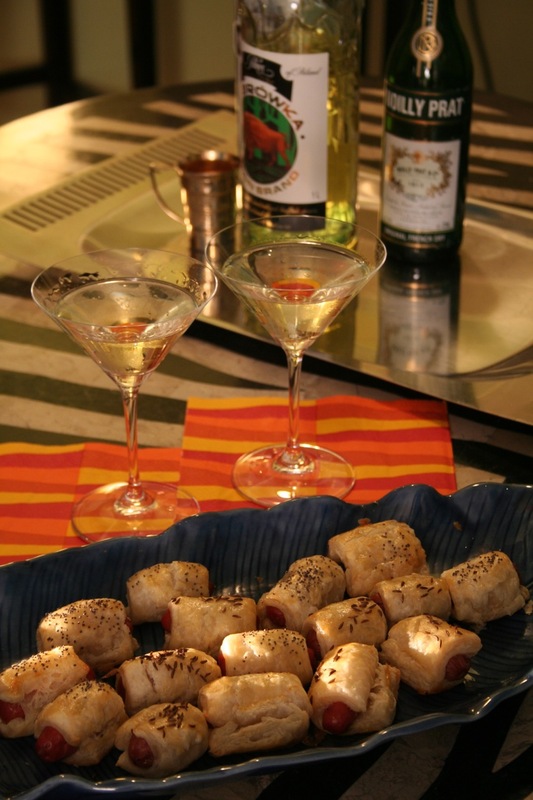 To read more and watch our video pairing Warmed Olives with the Vesper cocktail, click here.